Outdoor bred. 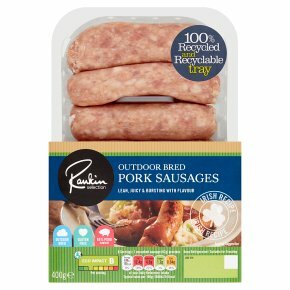 Gold award winner British sausage week 2016. Lean, juicy & bursting with flavour. 85% pork content. Irish recipe. Gluten free. No GM ingredients. No artificial colours or flavours. Cooking appliances vary. These instructions are given only as a guide. Ensure that the product is piping hot throughout before consumption. There is no need to pierce the sausages before or during cooking. Remove all packaging. Cook under moderate grill for 20 mins, turning frequently until golden brown. Paul's Tip: Cooking the perfect sausage. Personally I believe the best way to cook sausages is to fry them. Heat 2-3 tablespoons of oil in your frying pan and brown the sausages on all sides turning the carefully. When brown reduce the heat until cooked - approx 15 mins. Drain thoroughly on kitchen paper and serve.